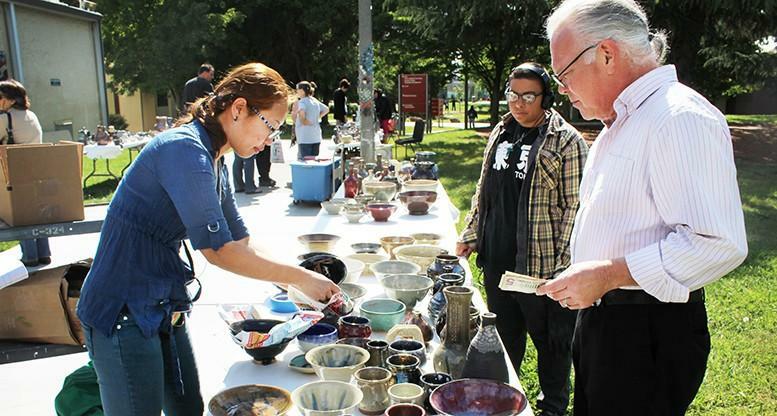 Student’s from the ceramics department sold their handmade wares today at the X-sale being held behind the ceramics lab. Michelle Wong Yukmui, an art major, has her own booth at the X-sale. “I’m selling some of my pieces today so I can make some extra money to move to Thailand with my husband. We want to open our own studio to teach wheel throwing,” said Yukmui. Wheel throwing is a ceramics technique that is used to create bowls on a wheel. A student passing through the sale said he always eats out of Yukmui’s bowls and doesn’t mind paying the price for them. Linda Gelfman, the art professor who’s leading the sale with her students, said the proceeds for this semester’s X-sale aren’t just going to the ceramics department. “This semester we’re also giving some of our proceeds to the kitty committee. Some of our students take care of the feral cats on campus,” said Gelfman. Prices for ceramic works ranged from five to 20 dollars. One of Yukmui’s friends Nicholas Batchelor, an electronic technology major, came to the X-sale to buy some of her work. “I’ve been coming to these X-sales for four years but I haven’t bought anything until now. I promised Michelle I’d buy some of her bowls today. Her art is beautiful,” said Batchelor. When asked what he’d use the bowls for, Batchelor said he’d use them for soup and cereal. Yukmui also has four pieces of art in the gallery area in the art department. “I wouldn’t have the skills and knowledge I have now if it wasn’t for Linda. She’s a fantastic teacher who will give you many opportunities to grow if you show interest and passion for what you do,” said Yukmui. The X-sale will be going on until May 14 from 10 a.m. to 2 p.m..
1 Comment on "Students from the ceramics department sell their art"
Selling art is not an easy thing. I love ceramics and find them quite beautiful. I would of loved to been at this event just to buy a ceramic cup or a ceramic bowl.